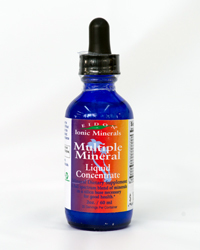 Eidon's Multiple Minerals are a complement of all essential and trace minerals necessary for good health. In any multiple mineral formula the key to its successful formulation lies in its mineral balance. Minerals work in a precise balance or ratio to one another. Too much or too little of even a trace mineral can decrease the effectiveness of a formula by limiting the availability of the other minerals. For people with well balanced mineral ratios or those looking for a basic formula to supply a well balanced broad spectrum of the most important mineral nutrients, Eidon's Multiple Mineral formula can be an excellent addition to your nutritional program. Eidon's formulation reflects the most current understanding for optimal balance in a mineral formula. The macro minerals, calcium and magnesium, are kept in a 1:1 ratio to correct the erroneous dietary trend of high calcium and low magnesium intake. The delicate triad of zinc, copper and manganese are kept in a specific ratio so as not to imbalance each other. Higher and equal levels of selenium and chromium complement the zinc, copper and manganese ratio. Boron is utilized with silica and sulfur in proportion to calcium and magnesium. Iron is included with careful attention to zinc, copper, and manganese. Iodine and potassium put the finishing touches on the formula within the current acceptability guidelines for mineral balance. Eidon's combination of balanced minerals, when consumed on a regular basis, can serve as a stable foundation for mineral nutrient supplementation.